We always love hearing about new wedding related businesses in South Africa and when two of our recent clients used the services of the Gift Tree Registry, we just knew we had to share it with our readers. Gift Tree is a premium, online gift registry service, which allows you to handpick your gifts from a generous selection of top quality brands and unique products. We promise to provide you with a stress-free and enjoyable gift registry shopping experience and to play a memorable part of your special event. It all starts with a personal consultation, ensuring that you select the best products to suit your home. The team will also talk you through all their premium brands so that you know what is available. 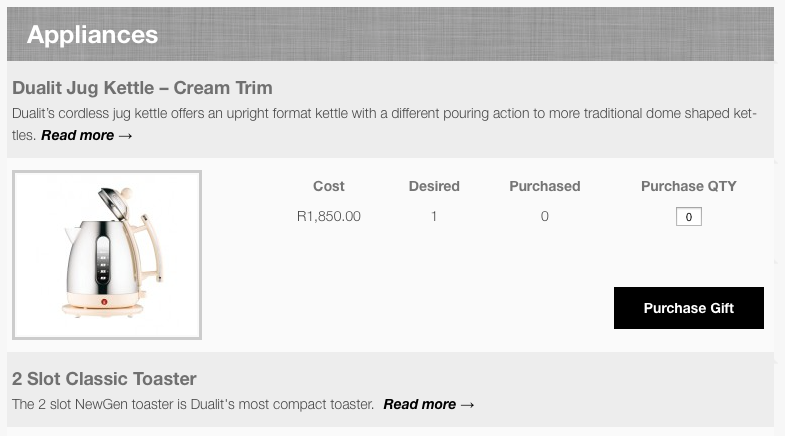 Once you have selected your items, the team at Gift Tree developed your customised registry page. This page is displayed on their website for your guests to browse. Take a look at a sample page here. You will receive Gift Registry Cards to add to your invitations - these tell your guests all about your registry. There is an option of an electronic version too. Gift Tree then provides you with a thank-you organiser so that you can send out Thank You's appropriately. It's that simple and that great. Quality, unique and premium gifts delivered straight to your door, what's not to love?